Hello there everyone! It is Andrea here and today I want to share with you a fun layout that I made using the new "Everyday Wishes" kit from The Fairytale Club! Yay! I am so in love with this new kit/collection! All the happy imagery, like the unicorn and the princess and the rainbow and the castle and the little blue birds, makes me fill with hope and reminds me to wish on stars and to dream big! The Fairytale Club is all about believing in fairytales and happily ever after come true...and I think this kit in particular stands up as a perfect example of that! Since I am so in love with this kit, I was of course, really excited to start playing with it! I have been finding it very difficult lately to do any scrapbooking because of my health situation and how bad the pain has gotten. However, I still try to do a little bit of scrapping whenever I can and so the other day I decided to pull out the new kit and make a fun, quick layout! I decided to use the new word die-cuts that come in the kit and make the phrase "my wish" for my title. The layout is about how my current wish is just to be healthy again and get back to a time when things were going better in that regard. So I used a picture from sometime in the summer of last year, 2017, right before things started going from bad to worse. I have had to deal with poor health because of my CRPS condition, for a while now, however the last several months have definitely been much worse. Despite this fact though, I still find myself believing in all the beauty and possibility in life and that my wishes and dreams can and will still come true! 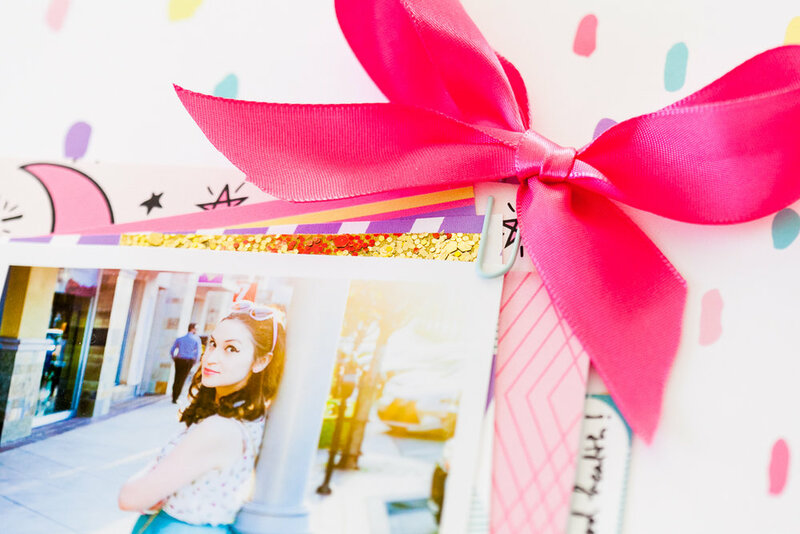 I layered several of the beautiful pattern papers behind my photo and to the top right of that I added a bow paperclip from the "happily ever after" version of the kit. On the bottom left, to balance things out, I added a cluster of goodies, such as my "wish list" ephemera piece and the yellow rose ephemera piece. 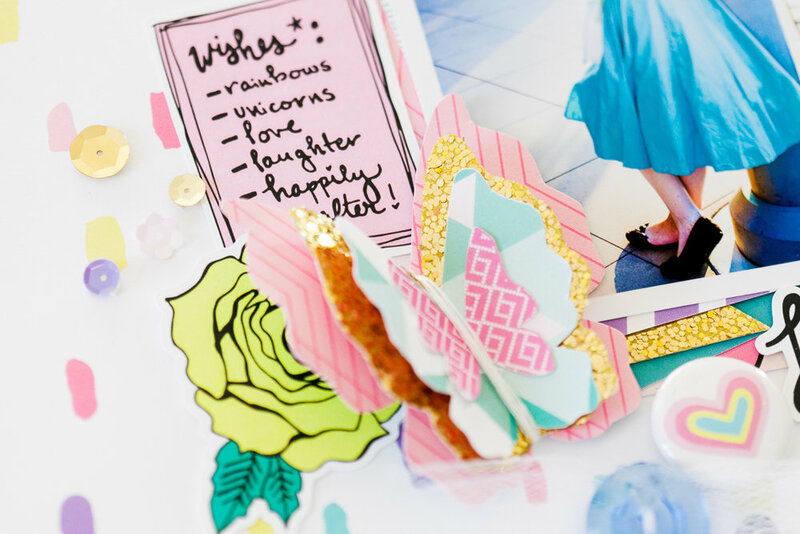 I just adore the ephemera pack this month...it is so filled with lovely and magical die-cuts! And with those die-cuts, I also added a layered, 3-D butterfly which I created out of several of the pattern papers and one of the butterfly ephemera pieces. It came out super cute I think! At the top of my layout, I added a little label from the cut-apart sheet which has a little quote about wishes on it...and to the side of my pic, I added another such label...this one with my wish on it..."I wish for good health". To finish things off, I added a couple of vintage buttons from my stash (and some white tulle from my stash) and one of the adorable flair buttons from the kit -- the one with the little rainbow heart! Overall, I am really happy with how this layout came out and I hope you enjoy it too! If you haven't ordered your "Everyday Wishes" kit yet, get it today! It really is made of my wishes and dreams and I think you will find that it carries with it such happiness and hopefulness from me to you!